The X-Terminator is a cheat device for the Sega Saturn, and is one of several poorly documented X-Terminator accessories for home video game consoles believed to have been developed by Gametech. The X-Terminator is said to be a GameShark device with an added secondary feature - it can connect to a separate device with an LCD screen (or a computer) which can be used to "detect" possible in-game cheats, without the need to key the codes in manually. Little is understood about the X-Terminator. At least two versions are known to exist - an original, almost no-frills device with unknown functionality, and a "Ver. 3" version with the aforementioned extra detection device. It is not known if there was a "version 2" released to the public - while units were sold in Japan, none are thought to have come to the west through conventional means. 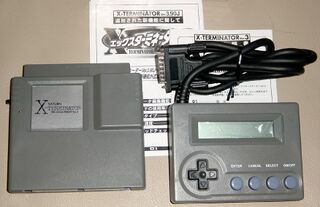 X-Terminator products are thought to have originated for the Super Famicom, with variants for the Game Boy (Color), PlayStation and the PlayStation 2 debuting in the years which followed. The DC X-Terminator offers similar functionality for the Sega Dreamcast.